Manggar Segarasari or well known as Manggar Beach is one of the favorite tourist destination for people of Balikpapan City. This beach is located in Manggar Village and Teritip, Balikpapan, East Kalimantan. It covers an area of approximately 13,000 square meters. Manggar Beach has a blue water and white sand beaches. The waves were not too big, just a small wave ripples are suitable for swimming. Around Manggar Beach were also encountered buoy rental place with various shapes and colors. The trees that surround the beach also helped give the impression of calm and cool. Interestingly facilities on the beach is arguably more complete than other beaches in Balikpapan. Many activities you can do in Manggar Beach, you not only can play water or sand, some water sport such as speedboats, jetski and banana boat are also available in this place. Besides you can also play beach volleyball or football and not have to bother because the net and the ball is already provided here. No need to worry if you feel hungry, because at the seashore will be found many food vendors. The vendors already provide lesehan style mat to sit and rest while enjoying a variety of culinary sold. The vendors provide many delicious seafood. The area surrounding the beach also offers some cottages or guesthouse for the visitors who spent some nights in this Manggar Beach. Besides the beach operators also provide tents overlooking the sea that can be used by visitors. 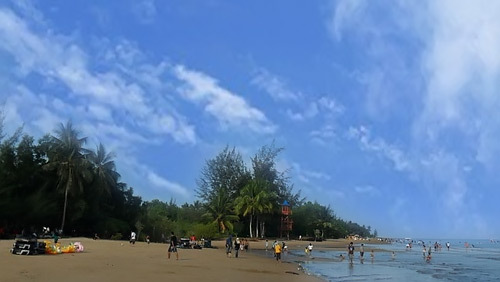 Some events are also often held at Manggar Beach. One of them is an international event such as the annual Kite Festival event and attended by 15 countries. Recently years, the local government of Balikpapan held this event for celebrating Balikpapan city was attended by more than 6000 participants. Manggar Beach location is approximately nine kilometers east Sepinggan or about 22 kilometers from downtown Balikpapan. To reach this place you can use a private vehicle or public transport. If you come from Terminal Damai, you can use public transport with number seven dark green and stop at Terminal Manggar. Additionally you can use a taxi. Access road to Manggar Beach is very good, all the way, you will meet with merchants’ beads and various souvenirs typical of Kalimantan. There is also a typical clothing merchants of East Kalimantan. Manggar Segarasari Beach is open daily from 06.00 am to 18.00 pm. To go to this beach, visitors will be charged a levy of Rp 2,000 for children and Rp 3,000 for adults.